An epic true story set against the backdrop of one of the wildest places on Earth, "African Cats" captures the real-life love, humor, and determination of the majestic kings of the savanna. Narrated by Samuel L. Jackson, the story features Mara, an endearing lion cub who strives to grow up with her mother's strength, sprit, and wisdom; Sita, a fearless cheetah and single mother of five mischievous newborns; and Fang, a proud leader of the pride who must defend his family from a rival lion and his sons. Disneynature's African Cats producer Amanda Barrett talks about the key role a wounded lioness plays in the pride. This 100-Page Educator's Guide presents additional curriculum ideas for teachers to incorporate additional elements form AFRICAN CATS into student' learning plans. Interactive lessons and outdoor activities are integrated into the Expanded Educator's Guide, allowing you to immerse students into the world of AFRICAN CATS and bring the savanna to your classroom in anticipation of viewing the film as a class. 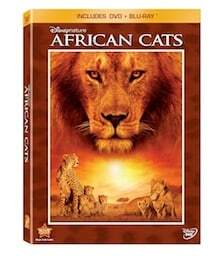 This 8-Page Activity Guide can be used to teach students about the science and geography themes presented in the Disneynature film AFRICAN CATS. The guide will increase student's knowledge of the African savanna habitat and the animals that live there, help students develop an understanding as to how living things are connected and why these connections are important, and enrich students viewing of AFRICAN CATS by inspiring appreciation for the animals and ecosystems of the African savanna.